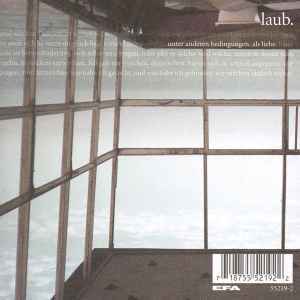 Laub's second album UNTER ANDEREN BEDINGUNGEN ALS LIEBE, starts off with the spare electronics of "Symbolisch," carried by Antye Greie-Fuchs's vocals until the beat finally kicks in. "Widergefühlich" is more chaotic, though, even as it resolves into something more melodic towards the end, while "Selten" gets more organic with its drum loop and late horn section, as opposed to the purely digital instrumentation on other tracks. "Augenscheinlich" also has a more real percussive section, here put into use as a mellow backdrop. The long "Grau. Unter Anderen Bedingungen Als Liebe" wanders quite a bit, which can be expected with 14+ minutes, "Losigkeit" starts with a more industrial bent, which persists even as it drifts into prettier territory, while "Einäugig" takes a more house path. An interesting album, though not one that particularly stands out.